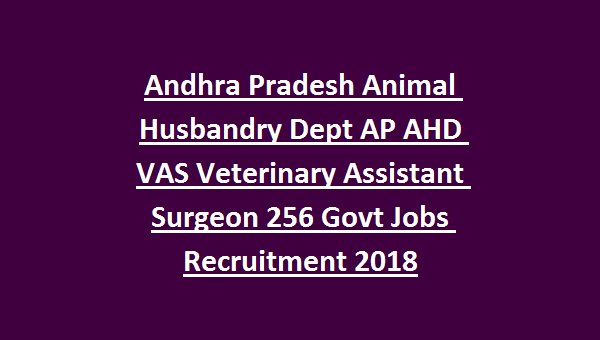 to submission of application form for these AP VAS vacancies to AP Animal Husbandry Dept is 15-12-2018. Based on merit in Degree marks candidates will be shortlisted. Candidates can apply online and then submit the application copy to AP AHD Dept before the closing date. 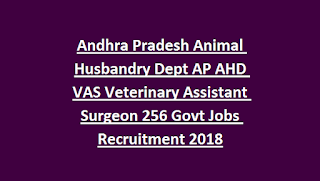 Age limits, salary, application process are given below for this Andhra Pradesh Animal Husbandry Dept Veterinary Asst Surgeon Posts. There are total 256 VAS posts are in this AP AHD Recruitment. 160 Posts are reserved for Male candidates. 87 Posts are reserved for Female candidates. Age limits cut off date is 01-07-2018 lower age limit is 18 years and upper age limit is 42 years. Candidates who qualified B.SC Veterinary Science and Animal Husbandry from any recognised university they are eligible to apply for this VAS posts. For VAS Group B posts B.VSc and M.VSc is required. Candidate selection will be on basis of merit in educational qualifications for this VAS vacancy. Download application form/or apply online for this AP AHD VAS from the official website of www.ahd.aponline.gov.in. Filled application form to be submitted to AP AHD department before the closing date of 15-12-2018.